This is a simple slideshow that shows pics with many colours on the screen. (More than the typical 16 colours, anyway.) This is a modification of the slideshow that comes with MagicKit, so credit must go there, too. Use of more than 1 palette for bkg & fade in & fade out. 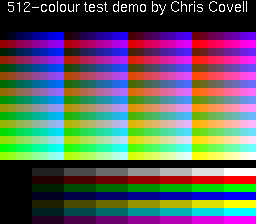 This is just a small demo that shows the entire available palette of the PCE/TG-16 at once. Every console has to have a demo like this, so why not the PCE too? Own tutorial to C coding , making the beginning of a RPG, with graphics from Tetsujin. Here is a music player designed for playing Genecyst .GYM files. It doesn't play them directly but uses its own format. Included in the archive is a program to convert .GYM files, a ROM, and the source for both. Here's a little "not finished" Dracula-like game. This is a game based on the old arcade game Targ. Not quite finished, but playable. New version includes source code. Demonstrations of the sound hardware of the PCE. Magic Engine or Hu6280 recommended to get good sound emulation.